Earlier this week, I review the brilliant new cookie book from Dorie Greenspan: Dorie’s Cookies. And I’ve posted one recipe for her Melody Cookies, a thin chocolate wafer topped with sugar sprinkles. 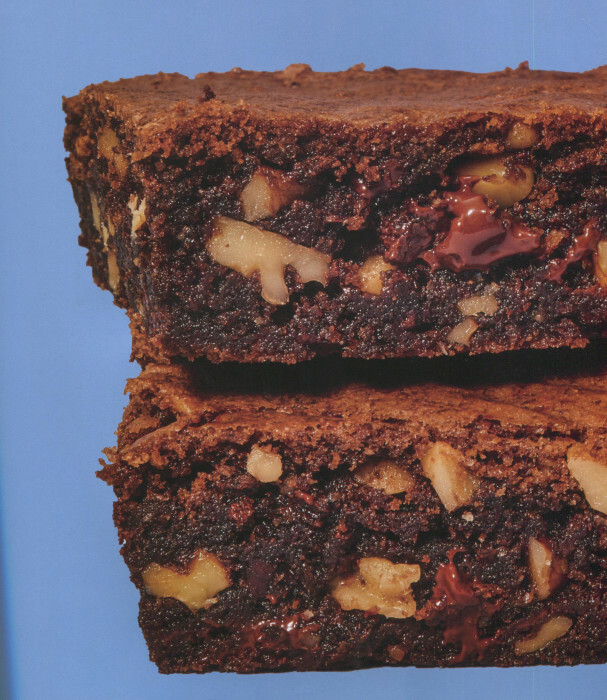 The first chapter of Dorie’s massive book is devoted to Brownies, Bars, Breakups, and Biscotti. Here’s brownie style cookie to help you pull an all-nighter, perhaps an all-weeker. That’s Dorie’s picture at the top and mine at the bottom. I substituted almonds for walnuts and got a different look but the same deeply chocolate taste. The combination of chocolate and coffee, to produce that dreamy “mocha” flavor, is irresistible. 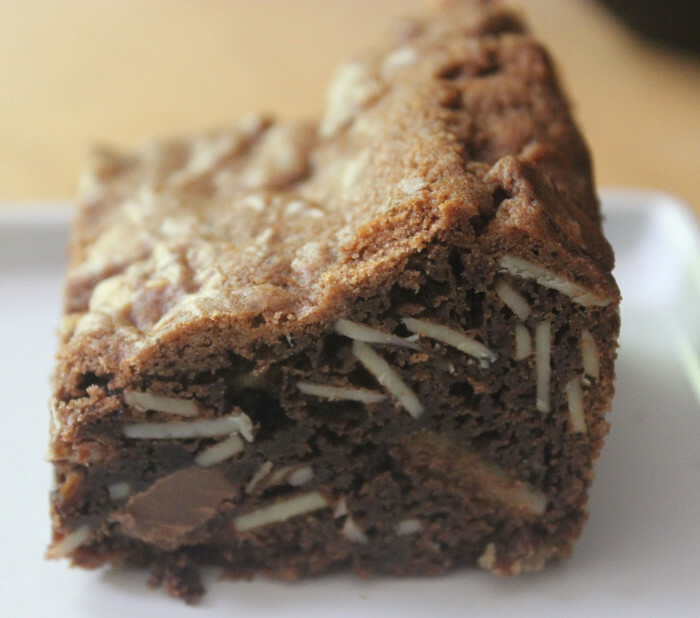 If you adore brownies, and can’t resist a new recipe, then here is one you must try. And, once tried, it will be repeated over and over. I am not responsible for your addiction. Although, I do share it. For my review of Dorie’s Cookies, just look here. Center a rack in the oven and preheat it to 350° F. Butter or spray a 9-inch square baking pan and line the bottom with parchment paper. Whisk the flour, cocoa, espresso (or coffee), baking powder and baking soda together. Working with a stand mixer fitted with the paddle attachment, or in a large bowl with a hand mixer, beat the butter, brown sugar, sugar and salt together on medium speed until smooth, about 2 minutes. Add the eggs one at a time, beating for 1 minute after each one goes in. Beat in the vanilla. Scrape down the bowl. Add the dry ingredients all at once and pulse the mixer a few times, then, when the risk of flying flour has passed, beat on low until almost incorporated. Add the chocolate and nuts and mix briefly; then mix by hand with a sturdy flexible spatula — you’ll have a thick, heavy, sticky dough. Scrape it into the pan, pushing it into the corners and evening the top as best as you can. Bake for 33 to 36 minutes, rotating the pan after 15 minutes, or until the top is dull, dry and wrinkled and, most important, a tester inserted into the center comes out clean. Transfer the pan to a rack and let cool for 30 minutes. Gently run a table knife around the edges of the pan, invert the block onto the rack, carefully peel away the parchment and turn the block over onto another rack to cool.